Interview carried out by Jack Little by email in July 2012. Featured in Issue 22. Andras Gerevich was born in Budapest, Hungary in 1976. 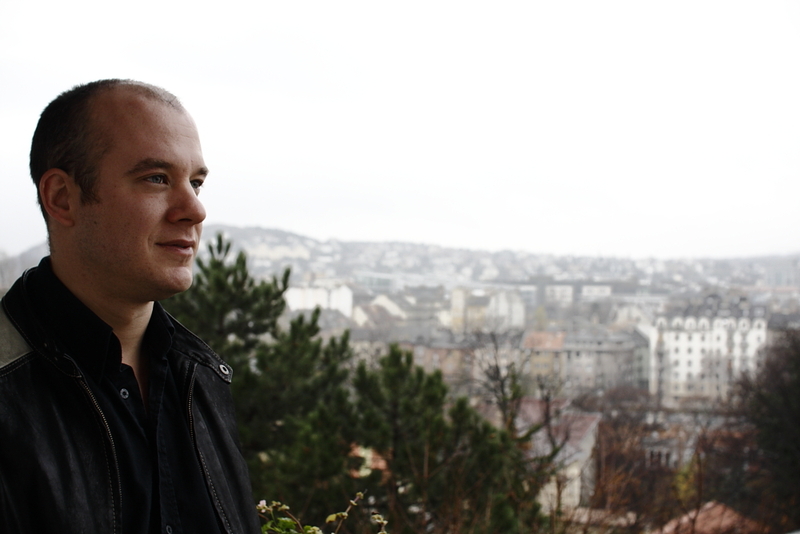 He graduated with a degree in English Literature from the Eötvös University of Budapest (ELTE), and later studied Creative Writing at Dartmouth College in the USA on a Fulbright Scholarship. His third degree is in Screenwriting from the National Film and Television School in Britain. Gerevich published three books of poems in his native Hungarian: Átadom a pórázt (Handing Over the Leash, 1997), Férfiak (Men, 2005), Barátok (Friends, 2009) and is also published widely in journals. A book of his poems in English translation Tiresias’s Confession, came out in 2008. His work has been translated into over a dozen languages, published in journals and anthologies, and taken part in a number of international literary and poetry festivals. He was editor for two literary journals: Kalligram in Budapest and Chroma in London, a producer for a radio program: ‘Poetry by Post’ for the BBC World Sevice, and is vice-president of the Hungarian Belletrist Association. 1.What inspires you to write? What inspired your latest collection? Every poem is inspired by something else, something different, even though generally I write about the problems I experience in my daily existence, both problems in my own life and in society around me. We all have thoughts, emotions and opinions that would be pretty inspirational for a poet -- the huge difference is that most people never sit down to turn it into a poem. As a young boy my mother was finishing her studies abroad, I did not meet her for long months. Those days there was no internet yet and phone calls from Budapest to the USA were close to impossible. So we wrote letters to one another. That is I dictated letters to my grandmother, who wrote it down, and also read my mother’s letters aloud to me. At this very early stage in my life I had learnt to express my thoughts and feelings in writing. This later developed into a love of writing poems. And writing in general. 2. Can poets make a difference in the fight against the rise of Hungary's far right? No. Most people don’t read. They watch television. People voting for the far right tend to have very little education and most of them are only interested in a very narrow range of books, writing that supports their views and not contradicts it. There is a romantic tradition in Hungary of poets raising their voice in political issues and making a difference. I think it is a myth, to make real change you always needed leaders and politicians, i.e. men of action. In history very few poets were capable of becoming inspirational political leaders. The moment a poet turns into a politician, which happens quite often in Hungary, he or she looses her voice as a poet, but not having a strong background in law or economics, they never become great leaders. 3. I have always thought that the Hungarian language to be very beautiful to listen to. What is your favourite word? Why? I don’t have a favourite word, the same way I don’t have a favourite colour or favourite film. The world is diverse, I enjoy the variety of sounds and colours. The melody and the music of a language being spoken is more than a single word. I prefer watching a different film or reading a different book every night. I love being inspired by finding and learning new words, sometimes even new concepts I had never thought of before learning the word. In a poem I am looking for the right words for a special context, a special mood and a special meaning, my favourite word is the one that is hardest to find and thus becomes very essential to the poem. It always depends on its context. 4. Do you prefer to read print or works online. Why? Where does the future of poetry lie? I might sound very old fashioned, but I prefer reading poetry and novels in print. I read the news on the internet. I like email, I do not miss handwritten letters. Even though I enjoy reading collected letters and biographies that were researched by reading old letters. I will miss real letters as a source to discover a person’s inner psyche. Our grandparents wrote 5 page letters, we write 5 sentence emails – it is a huge loss for our culture. Reading a book is more intimate than using the net, you do not have dozens of links, there are no alerts about new emails, etc, there are no distractions, its just the two of you: the reader and the book – thus I prefer reading literature in print. 5. Tell us about the future of Hungarian poetry. Who should we look out for? Hungary has a very rich tradition of poetry, it is a pity the language is so difficult to translate, thus very little is available in English. And most translations are just a weak and unskilful variation of the original, they are not the real thing. Translating poetry is the most difficult challenge, as content and form are equally important: the poetry of thinking and the music of grammar both a play a role that is hard to reconstruct in other languages. Plus poetry is so intimate that you need to know a lot about its social and cultural context. In a novel the author can explain the reader all the necessary details. In poetry, most of the time, you have to have a knowledge of the cultural-psychological background to understand the exact meaning of the lines. 6. I read a book recently about Matthias Corvinus' great library of the 15th century... who do you think has had the biggest influence on Hungarian literature? As in all Christian cultures, for centuries our literature was based on the Bible. The second most important source was Greek mythology and generally ancient Greek culture. If you read anything from the late 19th century, it is full of Biblical allusions. Matthias was a king of the Renaissance period, his court was modelled on the cultural standards set by the Medicis in Florence. Later, of course, German culture and literature were the most important. For centuries the upper and middle classes, the literati and the intellectuals were all bilingual: they spoke both Hungarian and German. English, French or Russian literature was not as influential, except for Shakespeare, of course, until the 20th century. 7. What will the world look like in 100 years? Is the future bright for us? I am strongly concerned about the destruction of our natural environment. Even if one examins what changes have taken place in the 35 years since I was born, it is very shocking. The human population has exploded, all the natural land has to be turned into farmland to feed all of us. Industrial production is also making huge gains, polluting the air and the water. The earth will get to a tipping point where everyone will start to panic, even US conservatives, and make an effort to turn this destruction around. I believe there is a long future ahead of us, with a lot of negative and positive tendencies, a lot of brightness and darkness.